My lovely friend, YA author Keris Stainton, has done a very good thing indeed. In order to raise money for the British Red Cross Japan Tsunami Appeal, she has set up an online auction for book-related goodies. A host of generous authors responded immediately to Keris’s idea (overwhelming her slightly, I think! ), offering brilliant prizes – including signed books, first editions, manuscript critiques, mentoring, and the chance to have a character named after you. 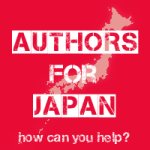 Bidding begins at 8am (GMT) tomorrow at Authors for Japan.